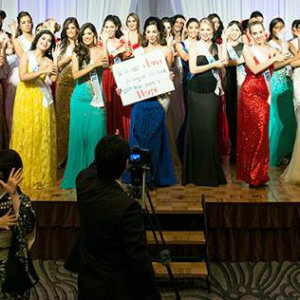 Puerto Rico’s victory was not predicted by any pageant-related website or blog. She was considered a major upset and her victory is one of the biggest surprises in Grand Slam history. However, the judges chose her, she deserved it, and we congratulate Valerie for winning it! 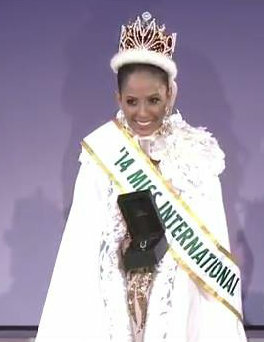 – Puerto Rico’s Valerie Hernandez placed 2nd on her national contest. 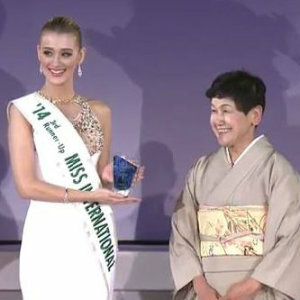 When the actual winner, Patricia Quiñones, gave up the crown for “personal reasons”, Valerie took the challenge over and traveled to Japan. Now her life has changed forever! – Production was very low-budget and the pageant was slow and long (over 3 hours!). 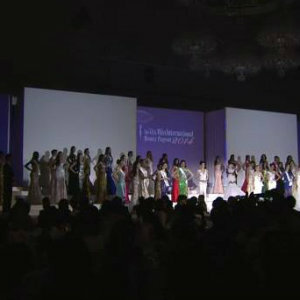 After all 73 women paraded in national costumes, swimsuits and gowns, the semi-finalists were announced and when on to give their tradition speeches. Stage was very poor. The most positive aspect of Miss International is the amazing cultural experience the candidates have in the weeks before the final. 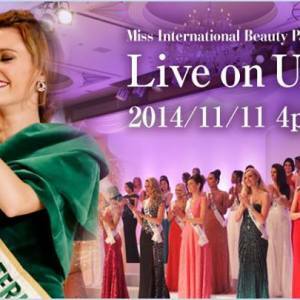 Miss International 2014 – Who will win the crown? 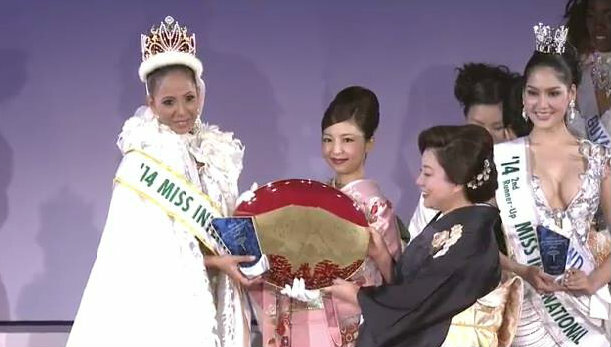 Miss Grand Slam 2013 – The Amazing Ten! 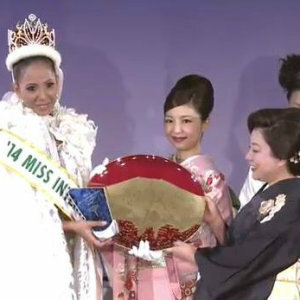 Congratulations Ms. PR, the new Miss International. I notice that her huge strong arms could also qualify her for the Caribbean Arm Wrestling Championships next month. She should also try her luck in that competition. 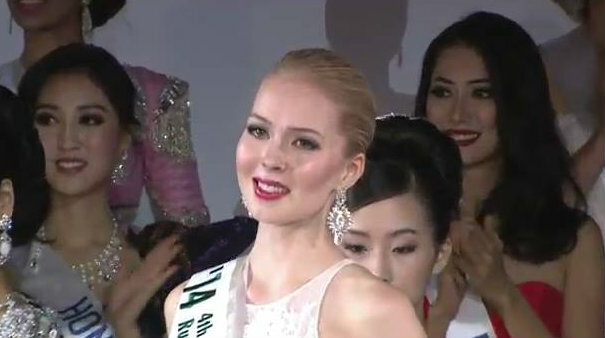 Why does GB always say Miss International, a low-budgeted pageant? GB? Bravo Panama, I knew you had dome a great job. There is an error in fhe story above. Valerie WON at Miss Teen International 2012. Please check your sources before publishing. We got this from the P Rican media. valerie competed in miss teen international 2012 and WON the pageant. she did not place 2nd as indicated above. WOW… I’m shocked… AND I’M PUERTO RICAN!!! No shade, but in an objective point of view, Mexico was my favorite. But then again, that means we have a new queen, so that’s good!! She seems very sweet and humble! Felicidades Valerie, orgullo boricua!!! CoNGRATULATIONS VALERIE…. a Taíno, African, and Spanish beautiful queen!! Your comment has been answered and approved. THIS IS BIG KARMA for PHILIPPINES! They are so arrogant & overconfident to have Back To Back this year but end up CLAPPING HARD! And thank to all PINOYS who bash & throw the words RACIST towards Puerto Rico in Misso! The KARMA slapped them so hard! I believe this is just the beggining! Puerto Rico deserves the title. However, Dee, do not generalize. KARMA might come back to YOU with a slap on your face… which is ONLY the beginning. She is maybe a great lady, but I don’t like her looks at all. Congratulations? I do not know, I do not believe she deserved it, India, Venezuela! PHILIPPINES must be a better place. La vida te da sorpresas, sorpresas te da la vida. Nobody taugh that Miss Universe 2013 was going to be Venezuela and she won. She was not the best, but she won. And I am very happy. We can agree all time. It is about time that the judges take in consideration more than beauty as a factor for a girl win a contest. It should be one of the requirement but intelligence, projections, and overall self-esteem. That is why Venezuela win frequently. Because they are beautiful, intelligent (some) and always have the a great self-esteem. Every time Puerto Rico wins something, GB have to say ‘surprisingly’ or ‘nobody expected it’ well, in one way or the other they’re all beautiful and fully prepared to be chosen as the winner. Beauty is different and depends on the eyes thru which you see it. Just like with the special of the ‘Most Beautiful Miss Universe’ they have a comment for the Puerto Rico winner like Marisol (1970) ‘She was never photogenic’ or about Dayanara (1993) ‘All the cellulite for an 18 years old’ Surprise to see Genesis in GB’s top 10 favorites for Miss World because they never talk good about PR. It has nothing to do with her being from Puerto Rico. Not even the people of PR had her as a possible semi-finalist, let alone the winner. Check other websites and blogs as well. A “surprise” does not mean something negative. Nobody said she did not deserve to win, on the contrary: as a polite, sweet, nice girl, she made the perfect choice for Miss International. Congratulations to her and to Puerto Rico. hahaha!! Well said GB. Jacksel, I think you’ve forgotten the GOOD feedback GB gave Bodine Koehler on Miss Universe 2012 (even winning GB’s best evening gown award), as well Monic Perez on Miss Universe 2013 (also winning GB’s best evening gown award) I also remember their good and OBJECTIVE comments on Janelee Chaparro ( Miss Grand International 2013), and other beauties as well… My point is, they r and OBJECTIVE website, giving us good info!! And why u so bitter, Puerto Rico won, so let’s b happy (cause I’m boricua 2)!! NIcely Said. The winner is sorta of cute. I agree what you said, they don’t include as favorites the beautiful girls from Puerto Rico. But i think is more admiration or should i say jealous rage. Congratulations to the beautiful girl from the island of the Caribbean!, she did a great job. And The contestants for MU and MW are really stunning too. So be careful global beauties , at the end you are not the judges the final night. Very well deserve she did a great job during the whole pageant. She was very polite, respectful, and most important she was very smart. She always expressed her gratitude with the organization for such a great experience and her final speech was what she needed to win the title. Very well deserve. Deserving winner!! Underrated in all forums and predictions but she is in fact very lovely!! Congrats!! Big surprise!! My favorite was Mexico, a very stunning girl. Why Netherlands and France were left out? Panama shouldn’t be in the top ten, especially with that ugly green dress! Well its over. Next!! Congratulations to PR! Miss Thailand is stunning and should have won the title. In my own opinion, it should have been Thailand or Colombia. BTH I didn’t even know that she was a contestant in MI however, What a silent killer?! 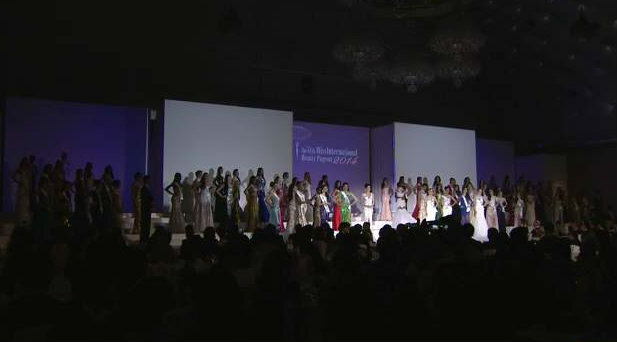 «Next Post Miss International 2014 – Who will win the crown? Miss Supranational 2014: see what lies ahead on this great event! 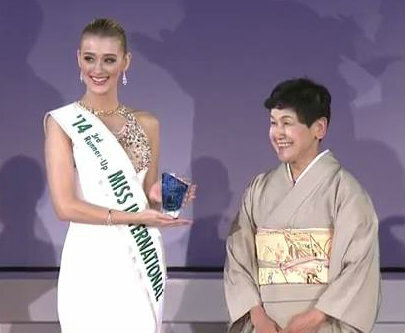 GB on Miss International 2014 – Who will win the crown?